Is it ever low enough? Quads are gaaaaaay! Why does everyone, and I mean pretty much everyone froth over them!?!?! I agree but you'd need to do as much as possible to make that thing look ok.
Quads look sick. Not sick enough to justify me paying for them but they do look awesome. Quad throttle bodies are insanely attractive. Both to the ears and the eyes. Quad headlights are a yes from me!! Nothing sounds better than a gt28-76 pumping stupid boost into a 4agte!!!! Watch this space, I have something special lined up. They're a yes from me too. They look awesome. I will never pay for them though. I'll probably never pay for a 4AGTE either..Won't have that kind of money until..Well, ever really. Imo you could have a half decent 4agte for the price of your 20v, after all the water and dizzy relocation stuff..
Yeah that's the photo Ben! With a decent front bar i reckon it'd look cool. Nah i honestly reckon you could.. How much is a 20v these days? 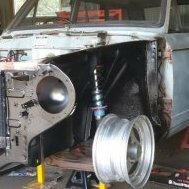 4agze can be had 1000 - 1500, Sell the charger for 400~ Use that money to buy a t28 and an ebay or decent used turbo manifold, run the water/ oil lines etc etc.. It's certainly do-able..